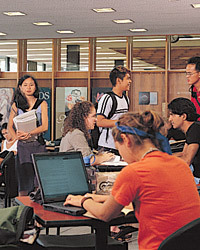 CS1130. Transition to OO programming. Welcome to CS 1130-004. LEC 16557. Course description: Introduction to object-oriented concepts, using Java. Assumes programming knowledge in a language like Matlab, C, C++, or Fortran. Students who have learned Java but were not exposed heavily to OO are welcome. This website is for students who are taking the self-paced version of the course. Those enrolled in a conventional section with lectures should use this website. There is no cap on this course; anyone can take it who has previous programming experience. Please read the "Course instructions" by clicking on the red link to the left and above. Hollister Hall B14 Mar 5 - Apr 13. Note that each assignment and test requires "mastery". That is, you will continue to submit each assignment, revised according to our feedback, until is is satisfactory. This may take 2 to 5 submissions. In the same way, each test may be taken several times until a satisfactory grade is achieved. There are no required lectures or discussions in this course. Two orientation sessions are scheduled, as given below. The room will not hold everyone. If you can go to only one, go to it; othereise, if you have tried the course before, go to the second orientation session, but if you are new to CS1130, go to the first orientation session. You can see the videos of the fall 2010 CS1110 course on www.VideoNote.com. Click Click for Cornell in the upper right corner. Sign in with your Cornell netId. Select Spring 2011 and Group CS 1110. Look at these regularly! Click the link "About the CMS" to the left to find out about our course management system. This self-paced course will teach you about the object-oriented (OO) aspects of programming using the programming language Java. Naturally, you will use other parts of Java —variables, expressions, the assignment statement, perhaps loops and arrays (similar to their counterparts in other languages), etc. But the emphasis is on OO. How one organizes and structures programs. Before OO, the major structuring mechanism was the subroutine (function, procedure), although some languages developed various kinds of modules. But OO introduces a new and classy organizational facility. And that is what CS1130 is about. Please read the Academic Integrity statement (link in left column). In addition, you must do quiz 0 on the CMS. This course is different from most of your courses, in the following ways. It is self-paced. Most students will do the work in 4 weeks. Some may do it in fewer, and some may take 5-6 weeks, although there will be a maximum amount of time allowed. Though S/U only, the course requires mastery of the material. If your programming assignments have errors or inadequacies, you will be asked to fix them. The two tests, which will not be overly difficult, must be passed at the 85% level —you may take a (version of a) test as often as necessary. The emphasis is on learning the material, but at your pace. No regular lectures! Instead, this web site contains 2-8 minute blectures (web lectures, lectures to be watched on the web) on most of the material. You may view these blectures, read the web pages, read the course text, and listen to lectures on the ProgramLive CD, which comes with the course text. Learn the material in a way that is most effective for you. The ACCEL lab will be open several hours a day, M–F, and you can get as much 1-on-1 help from consultants as you need. Click here for the schedule. The few quizzes are designed to ensure that you have learned important concepts. A consultant will give you the quiz. If you don’t do well, the consultant will immediately work with you to show you what you did wrong and help you learn the material. The grade on the quiz doesn’t matter; the important point is that you learn the material.